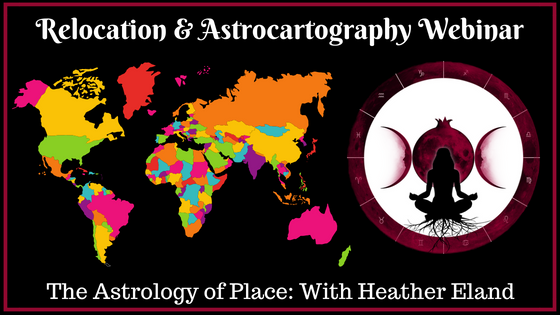 Join Heather for an in-depth webinar all about Relocation Astrology! In this five and a half hour course, we get into everything you need to know to find the absolute BEST locations to vacation, live and thrive! This webinar covers a lot of ground in a short amount of time, and will includes useful PDF handouts to refer back to, as well as plenty of examples and live Q&A! We even go over example charts together throughout the lesson so that those who are interested can practice and receive feedback in real time! An in-depth overview of astrological indicators via transits and the solar return chart for timing of a long-distance move or travel. Who is most likely to make a long-distance move, live in a foreign country, live a nomadic lifestyle or travel frequently for work or for leisure. Indicators in the birth chart for WHERE you should live (e.g., near mountains, the ocean, in a big city, or a rural area) and what your home environment should look and feel like in order to help you thrive in your place of living. A complete tutorial on how to generate an astrocartography map (using free software) and how to READ such a map. We’ll cover all of the planetary lines—the Sun through Pluto—and go really in-depth into the potential experiences associated with each planetary energy. How to find the BEST planetary energy in your chart and HIGHLIGHT YOUR STRENGTHS through relocation! This is, in my opinion, the most important and useful application of relocation astrology! How to read the relocated chart and pull it all together! I’ll give you tips and techniques for relocating to improve relationships, finances, career prospects AND MORE! For this webinar, a basic understanding of astrology and your own personal planetary placements is certainly helpful, but not entirely necessary. I will send PDF file instructing how to find your most important placements for relocation along with instructions for creating your own your birth chart drawing, astrocartography map, AND relocated chart drawing for any location of your choosing. We will break down what to do with all of this during the webinar, and you are encouraged to reach out via email with questions afterward. If you’ve received and reviewed all of the information mentioned above and you feel that you still need help sorting out your chart, please email me at heather@persephonereturns.com.